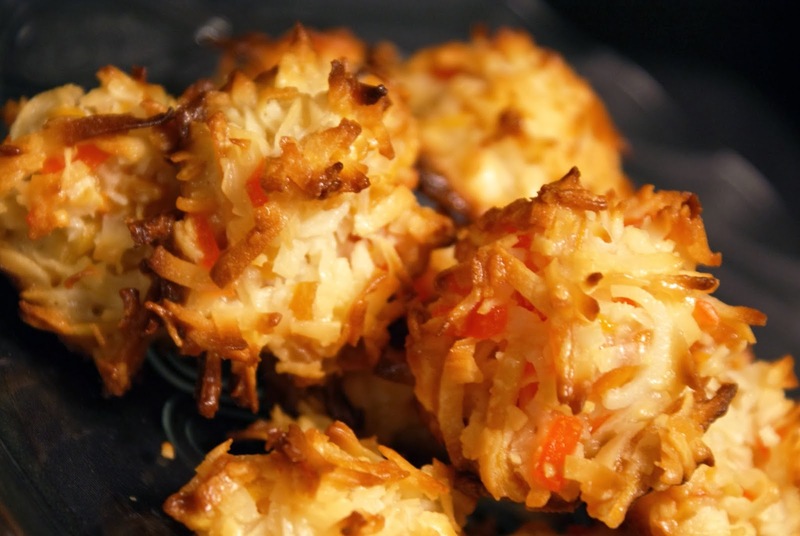 Recipe and Tutorial: Gluten Free Coconut Macaroons with a Twist! Several posts ago, I wrote about my experience making macarons, those delicate yet luscious whipped egg white and almond meal cookies sandwiched together with a rich filling. These are not them. This post is about coconut macaroons, which are rich, weighty, gluten-free morsels of coconut, egg whites and condensed milk. They are considered “cookies”, but my opinion is that they’re so sweet that they could also count as candy! These coconut macaroons in particular are delicious (but then, I wouldn’t usually post about something I made that *wasn’t* delicious, now would I?). Until a friend and I made these, I hadn’t thought of adding different ingredients to macaroons such as dried fruit; the “craziest” I had ever gotten was to drizzle melted chocolate over the finished product and call it a day. Once I had these macaroons, however, I knew I had found a new favourite! Line rimless baking sheets with parchment paper or grease; set aside. In bowl, whisk together condensed milk, egg white and salt. Add coconut, pineapple and mango; stir to coat evenly. Drop by rounded teaspoonful (5 mL) onto prepared pans. The variations with this recipe are only limited by your imagination and the availability of ingredients. Below are some suggestions, but feel free to try something else that tickles your fancy; just keep the ratios of the ingredients in mind, and substitute only “like” for “like”. Tropical Coconut Macaroons with White Chocolate: Dip baked and cooled macaroons into melted white chocolate to coat bottom or half of each. 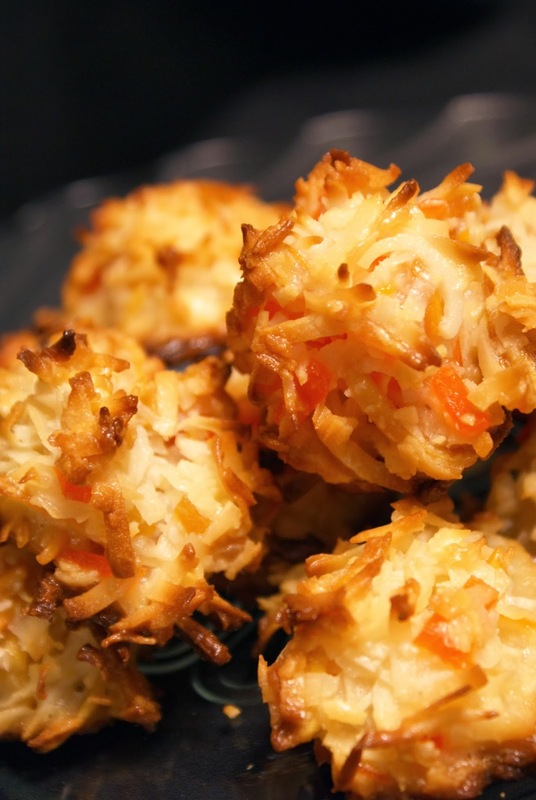 Ginger Coconut Macaroons: Add 1/4 cup (50 mL) chopped crystallized ginger to batter. Colourful Tropical Coconut Macaroons: Divide shredded coconut into three baggies; drop two drops of liquid food colouring into two of the baggies (red and yellow, for example), seal and shake until colour is evenly distributed throughout coconut. Recombine coconut and continue with recipe. Harvest Coconut Macaroons: Add 1/2 tsp cinnamon or nutmeg to recipe, and substitute slivered tropical fruit with 1 cup of a finely diced mixture of between two and four of the following: dried cranberries, dried blueberries, currants, raisins, dates, dried plums. Christmas Coconut Macaroons: Substitute tropical fruit for 1/2 cup each slivered green pistachios and finely diced dried cranberries. Chocolate Lovers Coconut Macaroons: Substitute tropical fruit with 1/2 cup mini white chocolate chips and 1/2 cup mini dark chocolate chips. Add 1/4 tsp instant espresso to the mix (optional). Dulce de Leche Coconut Macaroons: Substitute dulce de leche for the condensed milk, omit the tropical fruit and add 1 more cup of unsweetened shredded coconut. Next Post Recipe and Tutorial: Red Velvet Cake Two Ways, plus Two Frostings!